Simpson, Michael John. "Georges Erasmus". The Canadian Encyclopedia, 27 September 2017, Historica Canada. https://www.thecanadianencyclopedia.ca/en/article/georges-erasmus. Accessed 19 April 2019. Georges Henry Erasmus, OC, Indigenous leader, activist and spokesperson (born 8 August 1948 in Fort Rae, NT). Erasmus has been a leading advocate for the self-determination of Indigenous peoples in Canada. He has served as the head of several Indigenous public policy organizations, including the Dene Nation and the Assembly of First Nations. He also served as the co-chair for the Royal Commission on Aboriginal Peoples. Erasmus was born to a Tlicho (​Dene) mother and a Cree-Métis father. His family had 12 children, and they lived in a small Tlicho community in Fort Rae in the Northwest Territories. When Erasmus was a year old, his family moved to Yellowknife so he could attend a Catholic school. He completed high school in the 1960s. In 1976, at age 28, Erasmus was elected president of the Indian Brotherhood of the Northwest Territories, a post he held until 1983. (See also Indian.) Known as the ​Dene Nation after 1978, the Indian Brotherhood was a political rights group that sought to protect the interests of Indigenous peoples. (See also Rights of Indigenous Peoples.) During the late 1960s in the Northwest Territories, the Indian Brotherhood served as a counter to government organizations that were increasingly encroaching onto traditional territory, seeking to extract natural resources that were vital to the existence and lifeways of the Indigenous peoples in the region. Erasmus spoke on behalf of the Dene Nation on many occasions. Well-read on pertinent authors, including American community organizer Saul Alinsky, German philosopher Herbert Marcuse and the leaders of the American Indian Movement in the United States, Erasmus’s expressive language and radical positions often set him apart from other Indigenous leaders. In 1976, when Shell Oil met with the Dene Nation to conduct explorations for minerals in the Northwest Territories, Erasmus made clear to the company that violence and direct action would be considered, if necessary, to stop them from destroying their ancestral lands. Shell Oil backed down in this case, but the Dene and other Indigenous peoples have continued to defend their rights to traditional lands. In 1974, the Canadian government commissioned the Berger Inquiry to gather testimony on the environmental and social impact of a proposed natural gas pipeline, which was to run through Indigenous communities in the Mackenzie River Valley, including the Dene Nation. As a result, the commission heard testimony from several Indigenous leaders, in particular, Georges Erasmus. We have the full right, if we desire, of establishing a separate country of our own with a completely independent government — independent of the Canadian Federal Government. We have the right to completely and radically restructure government service, government systems, etc.… This is what we are seeking and we have no intention of giving up our rights to total independence for less. We have achieved international recognition as an aboriginal nation with rights to self-determination. The Berger Inquiry’s report, issued in 1977, found that the environmental impact of a pipeline across the delicate environments of the Yukon was too high, and decisively opposed any construction in that region. Amid these restrictions, the project was cancelled, which was deemed a monumental win by both Indigenous and environmental groups. A clever leader, he gained support from Indigenous communities in Saskatchewan, Alberta and the Atlantic provinces, and guided the organization effectively through the Oka Crisis. His work in these roles gained him the title of the “Eleventh Premier” — a name that recognized the strength and breadth of his leadership. He remained national chief of the Assembly of First Nations until 1991. 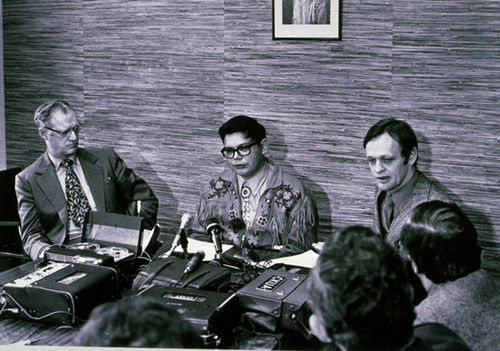 After the Oka Crisis, the federal government established the Royal Commission on Aboriginal Peoples in 1991 to assess both the historical and contemporary relationship between Indigenous and non-Indigenous Canadians. At the time, Erasmus had just completed his second three-year term as national chief of the Assembly of First Nations and resigned. He was subsequently asked to co-chair the commission with Québec Judge René Dussault. The five-volume report of the commission, released in 1996, made recommendations about how to best restructure the relationship between Indigenous and non-Indigenous peoples. An initial outcome of the commission was a statement of reconciliation from the federal government for the rampant abuse experienced by Indigenous children in residential schools (the government offered an official apology in 2008). There were also a number of important court cases and land rights claims that were settled between the federal government and Indigenous peoples, including the establishment of Nunavut in 1999. Not all of the recommendations were implemented; for example, the government has yet to abolish the department of “Indian Affairs” (now known as Indigenous and Northern Affairs Canada). Indigenous leaders continue to advocate for political change and reform. What are we going to celebrate? Are we going to celebrate that it took until 1959 before we could vote in this country? Are we going to celebrate that it took until 1968 that we could vote in Québec? ... Are we going to celebrate the fact that our Aboriginal languages are not considered important enough in this country to be regarded in any legal way?... I don’t like what has happened in the last 500 years, 125 years… what are we going to do about the next 500 years? What are we going to do about the next 10 years? ... I don’t think we have a solitary thing that we should be celebrating about unless we are going to do something different. In 1998, Erasmus became Chair of the Aboriginal Healing Foundation, a national charitable organization that had been founded one year earlier. Funded by the Canadian government, the organization focused on helping those affected by the legacy residential schools. The foundation’s community-based healing worked to address inter-generational trauma as well as to provide resources that encouraged sustainability and that promoted reconciliation. The Aboriginal Healing Foundation closed on 30 September 2014. 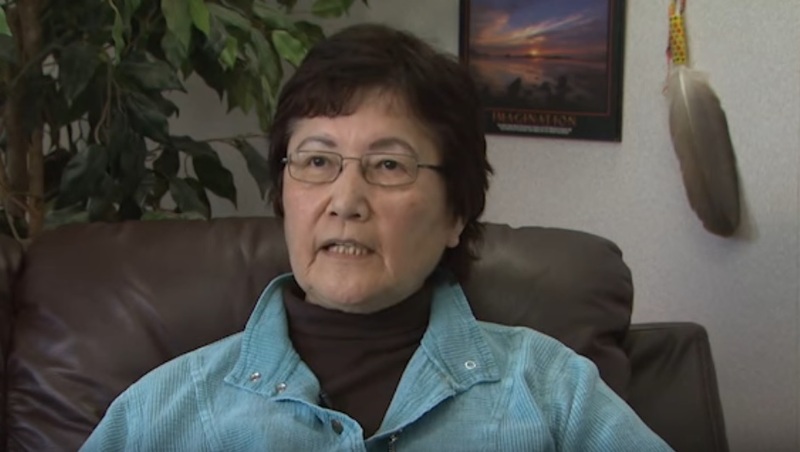 From 2003 to 2015, Erasmus served as the chief negotiator for the Dehcho First Nations, which had been involved in land claims and self-government talks since the early 1990s. At the age of 67, Erasmus retired from the position, citing family and personal reasons. Erasmus has received many honours and awards during his career. In 1999, he was made an Officer of the Order of Canada. Erasmus also earned honorary degrees from at least seven Canadian universities, among them Queen’s University, University of Toronto, University of Winnipeg, York University and University of British Columbia. In 2009, he was awarded the Governor General’s Northern Medal. Erasmus has contributed to various works, including an introduction to Drumbeat: Anger and Renewal in Indian Country. Published in 1989, this book lets Indigenous leaders tell stories about their own life and work. Writer and filmmaker Larry Krotz also interviewed Erasmus for a chapter in his book Indian Country: Inside Another Canada (1990). Erasmus’s famous statement “We the Dene” has been cited several times by various authors. The larger speech from which this statement comes is found in the book Dene Nation: The Colony Within (1977). 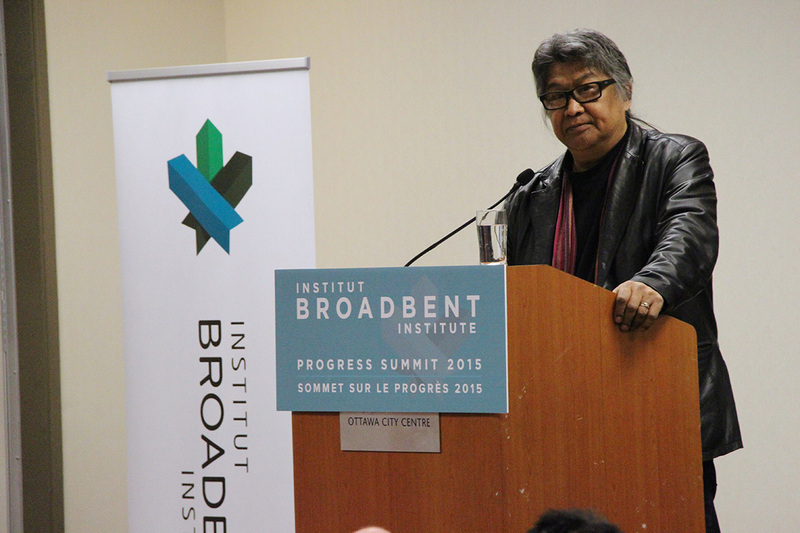 Georges Erasmus has been a passionate and effective spokesperson for Indigenous peoples in Canada. 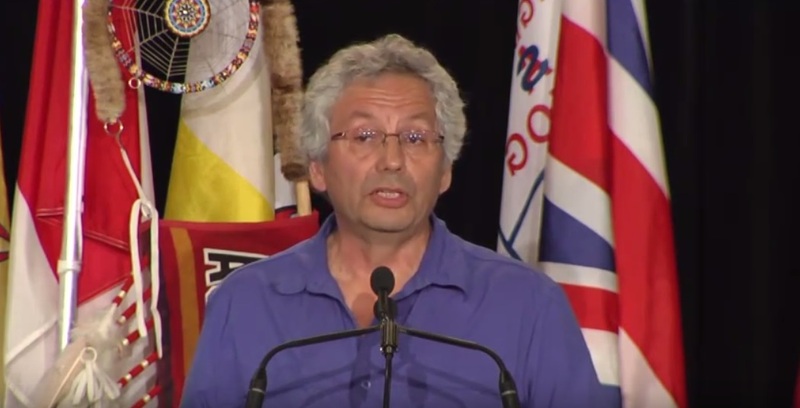 His work in the Berger Inquiry, the Royal Commission on Aboriginal People and various Indigenous organizations has brought awareness to political, economic, social and cultural issues in Indigenous communities. His words resonate and inspire many Indigenous leaders today. Mel Watkins, ed., Dene Nation, The Colony Within (1977). Boyce Richardson, ed., Drumbeat: Anger and Renewal in Indian Country (1989). Larry Krotz, Indian Country: Inside Another Canada (1990).